The last four decades of the nineteenth century constituted a period of mass immigration into the United States, most of it into the port of New York. Much was made of the slogan that America was the "melting pot" of the world. On the basis of this ideology, all of the progenitors of the new Cathedral insisted that it be built as a "house of prayer for all nations." It was a magnificent concept at the time, and is even more significant today. The location in New York of the United Nations, in 1946, underscored the importance of the idea. In 1888, the Board of Trustees initiated a contest for the Cathedral's design. The firm of Heins & Lafarge won the contract with a Romanesque, Byzantine design. Their plan called for a cathedral 520 feet in length crowned at the crossing by a towering conical spire. It would be built in the customary cathedral shape -- that of a cross. The next challenge was finding a site for this extraordinary house of worship. One spring day in 1887, a devoted layman, George Macculoch Miller, glanced west on 111th Street while walking up Fifth Avenue. Within a few days, Mr. Miller had shown the site to Bishop Henry Codman Potter. Both of them perceived the heights rising above Morningside Avenue as a potential acropolis. The thirteen heavily wooded acres were the site of the Leake and Watts Orphan Asylum. The property was purchased for $850,000. On December 27, 1892, St. John's Day, Bishop Potter laid the corner stone of the Cathedral. Bishop Potter struck the massive stone three times with a large wooden mallet, "Other foundation can no man lay, than that is laid which is Jesus Christ." Construction immediately ran into foundation problems, but Bishop Potter refused to change locations. 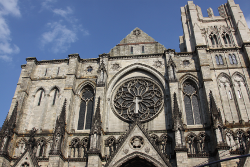 J.P. Morgan, the financier, who was a trustee of the Cathedral, gave $500,000 "to get us out of the hole." By 1911, the choir and the crossing with its four immense arches were completed . The renowned mason Rafael Guastavino built a dome of tile, 162 feet high at the apex, to cover the crossing. The original plans called for the dome to be replaced by a spire, but the Guastavino dome is still there today.